Dunkin’ franchisee Deo Braga, who like many long-time New England operators is originally from the Azores, says he learned to drink the dark, bitter shots of hot espresso with sugar. Today he is excited at Dunkin’s revamped espresso strategy. “It is the future,” he says. “It will make Dunkin’ bigger than it is now. Without espresso, Dunkin’ would be in a weak position.” From his perch on Cape Ann in northern Mass., Braga sees that iced espresso-based beverages are popular with his teenage and 20-something customers—especially young girls. His observations match what researchers are finding. According to a survey by the National Coffee Association (NCA), 48 percent of millennials say they had a cup of coffee they consider to be gourmet the day before. Franchisees like Luis Ribeiro, who has a network of stores in Rochester, NY, is among those who remember Dunkin’s original espresso-based beverage roll out in 2003. At the time, Dunkin’ called their foray an “Espresso Revolution,” promising “freedom from espresso oppression and the tyranny of long waits, high prices and confusing sizes.” It was a clear shot at Starbucks, the category leader, which popularized espresso beverages for Americans in the mid-1980s. But, through the years, espresso did not revolutionize the Dunkin’ business. “We told them the old espresso wasn’t great,” says Ribeiro, who is also Portuguese and grew up drinking espresso. Today, he says he is optimistic about Dunkin’ espresso. “It’s a category we need to be in and this time we have the right flavor and taste profile. We realized it was time to rebrand the category and give franchisees better quality machines and better quality coffee,” he says. At Ribeiro’s Next Gen shop, the new espresso machine sits right behind the register. “It draws a lot of attention, it’s lit up, it’s interactive and the customer can watch the employee making it and hear him banging it,” he says in reference to the practice of banging the pitcher of steamed milk on the counter to remove any bubbles before it is infused into a latte, cappuccino or macchiato. “There is a buzz around espresso right now, the question is can we make it stick?” he asks. Braga believes the key to securing a strong position in the retail espresso space is making a better cup than people can make at home. “You can’t imitate this at home. You would have to have the best equipment and the best beans,” he says. Dunkin’s espresso machines are made by Schaerer and cost about $12,000. Some busier shops are stocking two machines to keep up with the anticipated rush and make good on the promise Dunkin’ CEO Dave Hoffmann made at the recent media day. To accomplish what Weisman referred to as specialty drinks that are “blazingly good and blazingly fast,” Dunkin’ reimagined the work circles behind the counter by finding the optimal place to locate the machines to quicken workflow. It devised recipes to optimize speed and simplicity and provided four- to five-hour training sessions for store managers nationwide, according to Business Insider. “There are a lot of competitors in this space and we think if we go after the best espresso, and we have the machines and training and the people to deliver against that, we think that’s the best place we can be,” Hoffmann says. 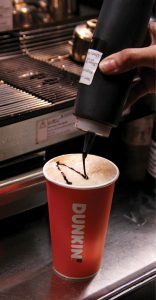 Going full steam ahead into espresso gives Dunkin’ a competitive advantage against convenience stores, which have ramped up their coffee offerings in recent years. According to Gordon, chains like 7-Eleven, Circle K and AMPM won’t invest the capital into buying espresso machines and training counter workers to become baristas. Plus, he points out, their clientele is more blue-collar and may not want to spend the additional money for a specialty drink. 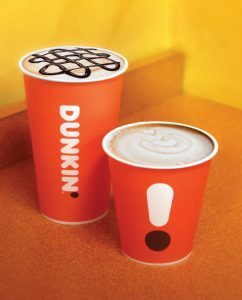 Speed is certainly a major consideration for convincing Dunkin’ customers that specialty coffees are worth the extra money, though the brand’s own $2 promotion for espresso drinks purchased between 2:00 p.m. and 6:00 p.m. has removed the financial consideration for those so inclined. The offer matches consumer preferences for specialty coffees, according to Gordon. “Specialty coffees sell later in the day,” he says, noting these drinks can also prompt customers to order a snack as part of the whole experience. Ribeiro reports he saw an uptick in afternoon sales as a result of the discounted espresso drinks. Results like that give franchisees a reason to believe Dunkin’ has a solid strategy for increasing sales after the morning rush (when drip coffee comprises the bulk of purchases), and appealing to a new generation of customers, for whom frothy milk and ice added to an espresso shot is as much a boost of excitement as it is a boost of caffeine. Franchisees appear united in their support for Dunkin’s espresso push. 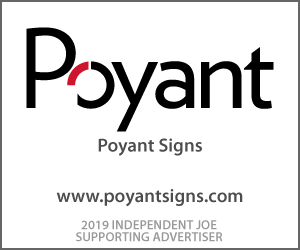 It’s a testament to the quality of the platform as well as the brand’s willingness to solicit franchisee opinions regarding the product and equipment. 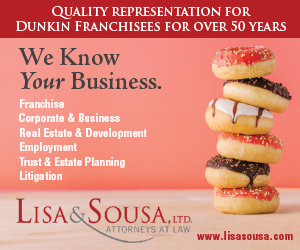 Octavio and Victor Carvalho, franchisees in Dunkin’s birthplace of Quincy, Mass., told reporters in November, Dunkin’s rebranding efforts and focus on espresso was the “right thing to do,” and a commitment that will be worth it in the long run.